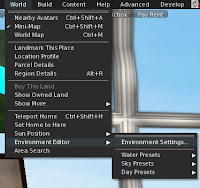 Since some time ago I'm thinking of making a small section for share small tips to make our Second Life easier. After reading the useful tutorial "Art of Editing" by Maggie Bluxome in Busted Magazine, I finally decided to start the section. The objective of the section is to make the blog more interactive with the readers too, so I hope you all participate with, for example, pics with results of the tips or even giving tips too to share with the community. Well, let's start with the first tip of the section, this time I'll talk how the environment settings can help us to get a perfect skin match with our prim breasts. The top left snapshot was taken with the default sun position at midday, if you look at the face you'll see ugly shadows that doesn't make me beautiful :-P, also the prim breasts look a little more lighter. 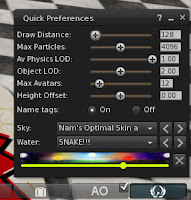 FireStorm viewer comes with some environments presets that will help us with it. 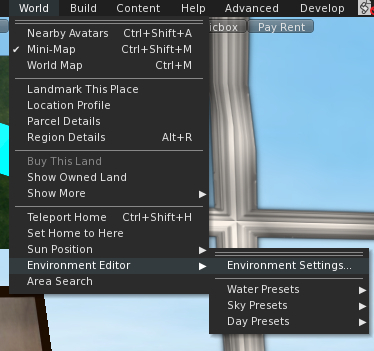 Go to World->Environment Editor->Environment Settings, below Sky Settings, mark the option Fixed sky and click on the list. 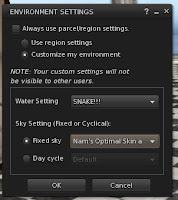 Nam's Optimal Skin and Prim. The name says it all, with the two firsts you'll get a really good looking skin, no more ugly shadows on the face, It shows how beautiful you are ;-). The third one will give us an almost perfect match between our skin and the prim breasts. 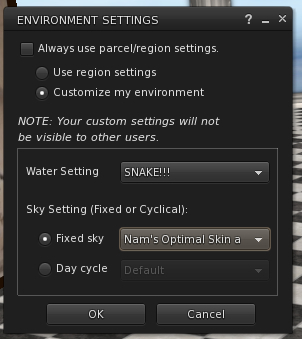 If you aren't using a custom skin, first set the Nam's Optimal Skin and Prim preset and after play with the colors of the prim breasts until you are happy. Note that you'll be the only one to see it, other people will see you how they have configured their viewer, but It's a very nice tip to take awesome pics ;-). If you aren't using Firestorm, leave a comment with the viewer you use and I will be happy to help you to make the same thing in it. If you use this tip I would love to see some snapshots before and after use it. Nam's Optimal Skin and Prim is my defacto Windlight setting. When I do my photography, I'll use shadows. But when I'm out and about in SL, I want everything to be clear and visible. I don't need shadows when shopping for shoes. I don't need sunset or sunrise. I just want to see the shoes as clearly as possible. When I am *tinting* I set the viewer to default day setting, remove ALL other lights (face, lash,hair etc bling) and use the color HUDs etc. Most will get you very very close, esier still if you have the rbg's of the skin (try color cop, it's free) , then I add the *fixer* layer and use the dropper to get the color of the skin at collar bone , set that and tweak as necessary. After closing everything I get pretty great looks in most all of my WL's (firestorm user). Shadows can get a bit problematic but not all the time. Mesh invasion in Tiny Things!